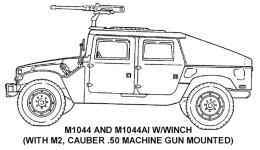 The M1043, M1043A1, M1044, and M1044A1 HMMWVs are Armament Carrier configurations of the HMMWV family. The M1044, and M1044A1 armament carriers w/supplemental armor provide added ballistic protection for armament components, crew, and ammunition. The vehicles are equipped with supplemental armor and the weapon mount, located on the roof of the vehicle, is adaptable to mount either the M60, 7.62mm machine gun; M2 .50 caliber machine gun; or the MK 19 Grenade Launcher. The weapons platform can be traversed 360 degrees. The difference between the M1043, M1043A1, and M1043A2 armament carriers w/supplemental armor and M1044 and M1044A1 armament carriers w/supplemental armor is that the M1043, and M1043A1, do not have winches and the M1044 and M1044A1 do. These differences affect vehicle length, vehicle weight, shipping dimensions, approach angle, and special winch-assisted operations. It does not affect the basic purpose, performance, or special limitations of the vehicles. Fully-loaded M1043, M1043A1, M1043A2, M1044, and M1044A1 armament carriers w/supplemental armor will climb road grades as steep as 60% (31°) and traverse a side slope of up to 40% (220). The vehicles ford hard bottom water crossings up to 30 inches (76 centimeters) without a deep-water fording kit and 60 inches (152 centimeters) with the kit. The M1044 and M1044A1 are equipped with winches. This feature permits recovery operations of similar vehicles. The M1044A1 models have the latest modifications applied to the vehicles.